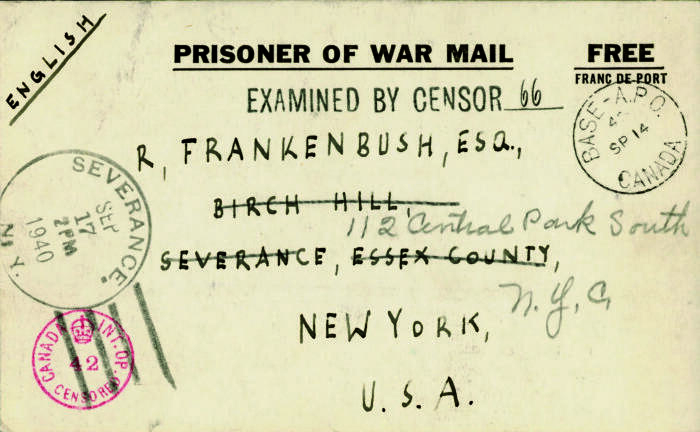 Place of Creation NoteArmy Base, Internment Camp 70, also known as "Camp B"
DescriptionPeter Ziegler’s “prisoner of war” postcard sent to R. Frankenbush in New York from Camp 70 (Ripples, New Brunswick), thanking him for his correspondence and for sending money and supplies. InscriptionsVerso is stamped and signed by Canadian censor 66 with postmarks. ProvenanceGifted to the Vancouver Holocaust Education Centre in 2011 by Peter Ziegler for inclusion in the "Enemy Aliens" internment exhibition.